London South Bank University (LSBU) celebrated enterprise with a Pop-Up Market and the Celebrate Enterprise Awards, whilst crowning the winners of the 2017 Make It Happen competition. Make It Happen is a competition for LSBU students and recent graduates who have the ambition, creativity and drive to succeed as entrepreneurs or freelancers. 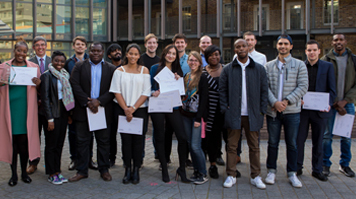 LSBU gives them the chance to win up to £2,000 and on-going support to take their enterprise to the next level. The Pop-Up Market, based at LSBU’s award-winning Clarence Centre for Enterprise and Innovation, gave students and graduates the opportunity to showcase their innovative businesses and projects. Cakes and sweet treats were provided by LSBU’s National Bakery School; alongside handmade jewellery, beauty products and oxygen-infused drinks. Adam Papaphilippopoulos, a partner at Reluctantly Brave, began the Celebrate Enterprise Awards evening with a keynote speech about authenticity in business. The winners of the Make It Happen competition were announced and students received a Certificate in Enterprise for attending enterprise events throughout the year. Student advisors in our Business Solutions Centre were also recognised for their support to local businesses. Freelance category: Still I Rise - Sandra Hibbert (Criminology with Psychology) won £1,000, Institute of Directors (IoD) membership and six months of office space to help her grow her freelance career. Idea category: Wake Up Gigs – Sarada Chunduri-Shoesmith (Integrated Care) won £1,000, IoD membership and six months of office space to help turn her idea into a viable business. Start-up category: Code and Wander - Chris Underdown (Music and Sonic Media) with business partners Alessia Sannazzaro and Liam McCabe won £2,000 to invest in their business, IoD membership and 12 months of office space.